A watch is a very important part of woman’s ensemble. The type of watch you wear says a lot about your personal style. From classy and sophisticated to flashy and bold, our range of beautiful used designer watches will be sure to be the envy of all your friends and family! Do you prefer a glamorous, chunky, fashion-statement watch or thin and elegant watches? Whether you like gold, white gold, rose gold, sterling silver or more, Smoke Tree Jewelers has it! Our wonderful variety of watches will help each individual find the best watch that fits their purpose from day to day watches, to special occasion watches and much more! 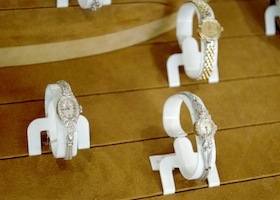 If you like glitz and glam then you will adore our watches with diamonds and gem settings. We also customize and resize any of our watches, so that you are completely satisfied with your purchase! We take pride in our outstanding customer service and aim to give our customers a fun and unique experience, so you will want to return for all of your jewelry and watch needs! Don’t let your fabulous style be diminished by an old or boring watch. Our experts at Smoke Tree Jewelry can help you find the perfect mate for your wrist that will not only bring your style the confidence and trendy edge you want, but also help you save money! Stop by our store to browse through our dashing watch collection today!